Journeys South — a project of the City of Philadelphia Mural Arts Program in partnership with the Historical Society of Pennsylvania — was a multi-disciplinary public art project that drew inspiration from both oral and archival historical sources to trace the history of South Philadelphia as reflected in the legacies of immigration. 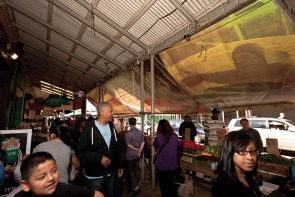 The Ninth Street Market is one of the nation’s oldest and largest working outdoor markets. 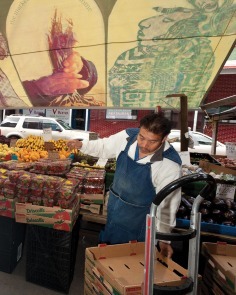 It is commonly known as the “Italian Market” but, like all of South Philadelphia, it has always been a place of distinct ethnic identity intertwined with diversity. From the Market’s beginning at the turn of the nineteenth century, Jewish, African American and Irish merchants and employees have worked side-by-side with the Italian merchants who made Ninth Street their cultural and commercial home. In recent decades, it is Asian, African and Latino immigrants who have joined the mix of the Market. It is a place where you still can find every Italian food imaginable, but now also fresh tortillas and jackfruit. Continuity within transition: "Different Paths, One Market" embraces this aspect of the Market by telling the stories of both recent immigrants and historic Market families. And it focuses our gaze on the most humble and most historic merchants in the Market: those curbside vendors who have sold fruit and vegetables from stalls,standing outside on the pavement day after day in all sorts of weather, from the 1880s up to the present moment. Their businesses are a look backwards in time, an experience of grocery shopping that is almost non-existent in America today. 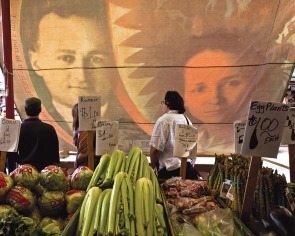 In the creation of their work, artists Michelle Angela Ortiz and Tony Rocco interviewed over forty Market vendors, workers, store owners, and residents. Eight of these stories were visualized on the vinyl awnings that shelter the vendors from the sun and the rain. The awnings were reimagined by Ortiz using monoprinting, gel medium photographic transfers, stencils and painting, and incorporating family photos and Rocco’s photographic portraits. This project has been funded by The Pew Center for Arts and Heritage through the Heritage Philadelphia Program.